A patent provides exclusive rights during its term to exploit the patented invention. In Australia the Patents Act 1990 (Cth) (Patents Act) protects intellectual effort by granting exclusive rights, during the term of the patent, to exploit an invention and to authorise other persons to exploit it. The owner is entitled to defend the patent against infringement from third parties in the patent area – which in the case of Australia is the Commonwealth of Australia – during the term of the patent. What are the different kinds of patents in Australia? An innovation patent provides protection for ‘lower level’ inventions that are not sufficiently unique enough to qualify for standard patents. They are less expensive and easier to obtain than a standard patent. What are the threshold requirements patentability? A patent is defined in the Patents Act as either a standard patent or an innovation patent, with the main protection difference being the duration of the monopoly rights granted (twenty (20) years for standard patents and eight (8) years for innovation patents). Once a Patent is granted, the patentee has “the exclusive rights, during the term of the patent, to exploit the invention and to authorise another person to exploit the invention” (per section 13(1)). not have been secretly used in the patent area before the priority date of that claim by (Secret Use). it must provide sufficient information and instruction for a person skilled in the field that the patent relates to be able to perform the teaching of the patent and produce an invention falling within the claims of the patent (Sufficiency). The assistance of a patent attorney is essential when drafting and filing the patent specification dealing with these issues. Is there anything that cannot be patented? plants, animals and biological processes for the generation of plants and animals for the purposes of innovation patents (Section 18(3)). the grant of another patent which claims the invention in a claim of the same or later priority date (section 23). How long does patent protection last for? The term of a standard patent is twenty (20) years (section 67). The term of an innovation patent is eight (8) years (section 68). Where a patent relates to a pharmaceutical substance, a party may apply for an extension of the term of the patent under section 70. What is the priority date of a patent? Section 43 provides that every patent must have a priority date. Section 43(2) provides that in most circumstances, the priority date will be the date of filing of the specification (the application date). There are some exceptions to this, and patents based upon an earlier patent may have different priority dates. A patent provides strong protection and economic benefits for the patent holder. If the patent is a revolution in a popular industry, it could be worth millions (possibly even billions of dollars). It is therefore vitally important that anyone wishing to patent an invention ensure that they comply with the requirements for obtaining a patent, or they risk having it revoked at a later date. Seeking professional advice from lawyers and patent attorneys at an early state of the patent application process is very important. 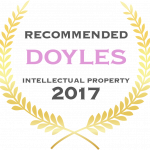 If you need assistance with intellectual property protection please telephone me for an obligation free and confidential discussion.